Small is cool. But so is controlling your media choices. And these days, we think most people would choose the latter. 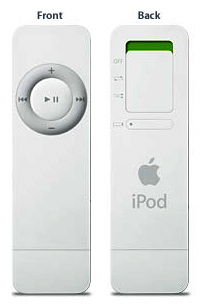 Plus, it’s not as though the basic iPod, in its current incarnation, is cumbersome. As the tagline for the shuffle says, "Life is random." Controlling what we see and hear is one way most of us fight back.